IT can be tricky making sure your kids are kept busy during the long summer holidays to avoid the dreaded boredom setting in! 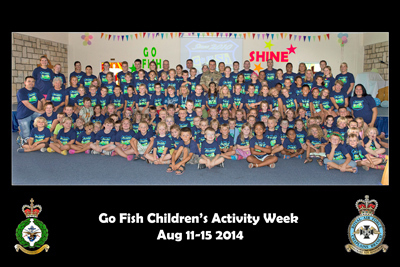 This August, more than 100 Service children came together for the Go Fish Summer Holiday Club at the Chaplaincy Centre at RAF Akrotiri, Cyprus. An army of volunteers provided a week of music, dancing, stories, craft, games, prizes and more – the children kicked off each day with face painting and art work groups and at the end of the morning, gathered for a finale of music, dancing and prize giving before home time. The aim was to create a fun time for the children, offering respite for their parents at a low cost. Funding and support was received from Akrotiri and Episkopi Stations as well as the Army Welfare Fund and Joint Education and Training Service (JETS). The team are hoping to repeat the programme in 2015 and hopefully expand it to include Dhekelia and Ayios Nikolaos Stations. If your family is based in Cyprus and would like to know more about what activities are available, visit bfgnet.de/hive-europe and click on “HIVE in Cyprus” where you will find “what’s on” guides for your area.